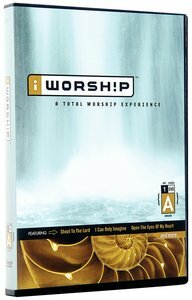 The revolutionary IWorship DVDs merge sight and sound to create an entirely new way to worship! Including songs like, 'I Can Only Imagine' and 'God of Wonders,' these DVDs offer optional lyric subtitles, focus themes and more. These revolutionary new DVDs add an interactive dimension to worship - combining the power of the world's best-known worship songs with breathtaking videos for use at home or church. Each DVD includes 7 powerful songs, combining sight and sound to bring the world's most significant worship songs to life. Plus, DVD flexibility allows you to choose full stereo, split track, and click track to accompany a full range of performance needs - customising playback for personal worship, small groups, and large congregations.